Decoration accessories: V2A stainless steel base plate for rod bracket. Base plate for rod bracket, V2A-stainless steel. Stainless steel base plate, suitable for all rod brackets. For expansion and custom manufacture of curtain sets and decorations. Base plate mounting system: fig. with rod bracket Top 16 2-rail. Deco-accessory, base plate for rod bracket, V2A-stainless steel. 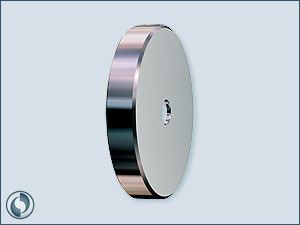 Deco-accessory by Stahldeko: base plate made of stainless steel for Stahldeko bracket systems. Suitable for all Stahldeko rod brackets. Mounting with screw-fixed plate (like fig.) or with bolts (Pfosten 16), bore holes and screws are covered with base plate. Brackets are screwed on the base plate. For expansion and custom manufacture of curtain sets and decorations. description: Base plate for rod bracket, V2A-stainless steel. Rod bracket Sont10, stainless steel V2A. Rod bracket Primo 16, stainless steel V2A. Rod bracket Top 16, V2A-stainless steel. Rod bracket Pfosten 16, stainless steel V2A. Rod bracket Sont16, V2A-stainless steel.